Meniere's disease is a disorder of the inner ear that can cause severe dizziness, vomiting, ringing in the ears, and can disable you for the better part of a day or more. It is a non-fatal, non-curable condition. Non-curable? Well, think of it like having an allergy to something... nothing they can do will make you no longer allergic to whatever it is you're allergic to... but once you understand the fact that you do have this allergic condition, you can find ways to avoid triggering it. My experience with Meniere's disease began during the first half of 1995... I had a total of about a dozen severe attacks over six months or so. During an attack I would get extremely dizzy within a matter of 5 or 10 minutes. Sometimes I would begin vomiting. During an attack I was too dizzy to walk or do anything except lie down. The most effective strategy to feel better seemed to be lying down very still, taking Meclizine and a good nap. After about an hour or two I could feel it start to work... but I usually still felt pretty lousy, or as Meniere's sufferers often say "out of sorts", for about a day after an attack. At first I had no idea what was causing my attacks nor did I really understand the nature of the problem at all. After several visits to the emergency room and a referral to a good ear/nose/throat specialist, I came to learn that it was Meniere's disease. My doctor was able to explain it a little, but I was able to learn quite a bit more about Meniere's from looking it up on the Internet. The severe attacks that I experienced in 1995 were triggered by the stress caused by sleep disruption from a goofy work schedule I had at the time. Once I got out of that job assignment and back to one with a traditional schedule, my stress was relieved and my Meniere's attacks went away. One frustrating aspect of dealing with Meniere's disease, or any inner-ear disorder, is that you don't generally LOOK sick to other people. Your friends and co-workers may think you are making the whole thing up, or that you're a little crazy. 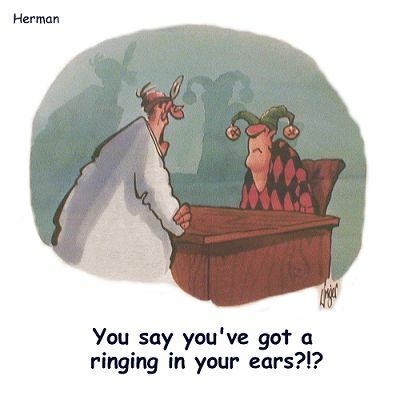 During the period in 1995 when I was experiencing severe problems with Meniere's attacks, I had "the supervisor from hell" who was convinced I was just making up a story to get out of work. He even tried to fire me! Thank goodness for my labor union, and a little legal intervention by the state of California. Meniere's disease involves a dysfunction of the inner ear or semi-circular canals. The inner ear is a sensory organ responsible for providing the brain with information about the body's relative position in space. Meniere's disease is a relatively rare disorder seen more frequently in middle age. The cause of Meniere's disease remains unknown. Meniere's is a recurrent disorder. Common symptoms include vertigo (spinning sensation), ringing in the ears, decreased hearing acuity, and a sensation of "fullness" in the affected ear. Symptoms can be quite variable, and patients may have more of one symptom than another. Evaluation will include a CT-scan of the head or MRI to rule out any possibility of a central nervous system problem (i.e. brain tumor) which could give rise to these symptoms. Special nerve conduction studies known as "evoked potentials" will disclose abnormal functioning of the auditory nerve itself. Treatment for Meniere's is difficult, and it often includes medications to suppress the symptoms. A low salt diet will be recommended. Surgery has been used in the treatment of difficult cases. During my 1995 bout with Meniere's I was treated by a number of doctors, including an Otolaryngologist (specialist in surgery and treatment of ear disorders). An MRI of the brain and ear was performed to rule out the possibility of physical damage including a brain tumor. Nerve conduction studies were also performed. I also reduced my intake of certain foods and medications that can trigger Meniere's attacks. One doctor made a brilliant suggestion that ultimately led me to figure out the cause of my attacks, and to a solution... he suggested I keep a log of my attacks. I wrote down when they occurred, and anything unusual I had eaten or done in the day or two prior. (He suspected I was reacting to salt in my diet.) Once I did this, it became totally obvious that my attacks had nothing to do with food, and everything to do with stress and disturbances to my sleep schedule. Every time I worked night shift, or didn't get a good night's sleep for one reason or another, I had an attack. All of this was happening at a time of extreme stress at work. The log of my attacks made it all so obvious! As I mentioned earlier, my attacks stopped once things got back to normal for me at work, I started working a normal schedule, and my sleep pattern stopped being disrupted. In fact, it's VERY common for people to have a period of Meniere's attacks, and then for the problem to eventually go away. So don't worry. Only the most severe cases will cause a permanent problem that may require surgery. Unfortunately, in 2000 I started to have trouble with Meniere's AGAIN. It's was really distressing to start getting attacks again after I thought I had it beat!. I had quite a few attacks in 2000 and 2001, and once again it looks like stress had a lot to do with triggering them. The worst of the attacks occurred in October 2000 when I was putting in 72 hour work weeks at the Diablo Canyon nuclear power plant. Later, in September of 2001, working in a new very stressful job situation, I started having dizziness attacks almost DAILY. Luckily the attacks were mild during that period and I was able to continue working. In fact, I went several months at my new job before I even mentioned Meniere's to my new co-workers. Even when I did have a very severe attack in 2000 and 2001, it was a lot easier for me to handle them compared to when I first started experiencing Meniere's symptoms back in 1995. I think the reason for this is that over time I learned what to expect and how to deal with the attacks. Once I understand the disease, I feel a lot more in control and I didn't have the fear of the unknown. In 1995 when I first started getting the attacks, I literally thought I was going through something that might kill me. I came to realize that it was not that serious and that if I just take some Meclizine I would be well again soon. One thing I realized in the fall of 2001 was that I had been drinking an average of three cans of diet cola per day. As an experiment, I stopped doing this and drank water instead... and lo and behold I started having much less frequent problems with Meniere's. Thankfully, in the years since then I have had almost no problems with Meniere's disease at all. Eventually, things improved with my job situation, I returned to working very normal hours, and I was experiencing a LOT less stress. My sleep schedule got back to normal, and basically my whole life returned to normal. I never experienced any problems with Meniere's Disease again after that point, with the exception of a permanent ringing in my ears and a permanent hearing loss in one ear. If you recently started having problems with Meniere's attacks, the first thing I'd recommend you do is start keeping a log of your attacks. Write down when each one occurs, and what things have been going on in the day or two preceding the attack. Write down foods you ate, things you drank, medicines you took, how much sleep you got, and anything unusual that had gone on prior to the attack. In time, you may be able to spot a pattern to your attacks. 1. Cut back on the salt in your diet. 2. Eliminate alcohol, coffee, tea, colas, soft drinks, and chocolate from your diet. 3. Make sure to get a good night's sleep every night. 5. Eat small meals, at regular intervals throughout the day. Just try making one change at a time. Try it for a week or two and see what happens. Keep a log of your attacks so that you can spot any patterns. Finally, I'd like to suggest you buy some Meclizine. It's an inexpensive medication that is sold without a prescription, and it seems to work pretty good -- for me, at least -- at fighting those nasty Meniere's attacks. When I start to have an attack, I just take 50 milligrams of Meclizine (two pills), lie down and take a nap for an hour or two, and after that I'm usually well enough to get up and get on with things. Even with a strong attack with vertigo, vomiting, and the whole nine yards... that's usually all it takes to make me feel what I call "90% better"... not all better, but good enough to walk, drive, eat, or whatever I have to do. Ask your pharmacist for some Meclizine... even though no prescription is required, it's often kept behind the counter. And remember... don't take Meclizine to try to prevent an attack... only take Meclizine during or after an attack of Meniere's Disease.